“My general take on politics right now is that the only party more dysfunctional than the Republicans is the Democrats — or vice-versa,” said Daron Shaw, co-director of the poll and a government professor at the University of Texas at Austin. But he said the numbers seem to reflect Republican satisfaction over passage of a major tax bill and loyalty to the president after a year in office. Congress got better grades from the poll’s respondents in this year’s first poll than in the previous UT/TT Poll in October. 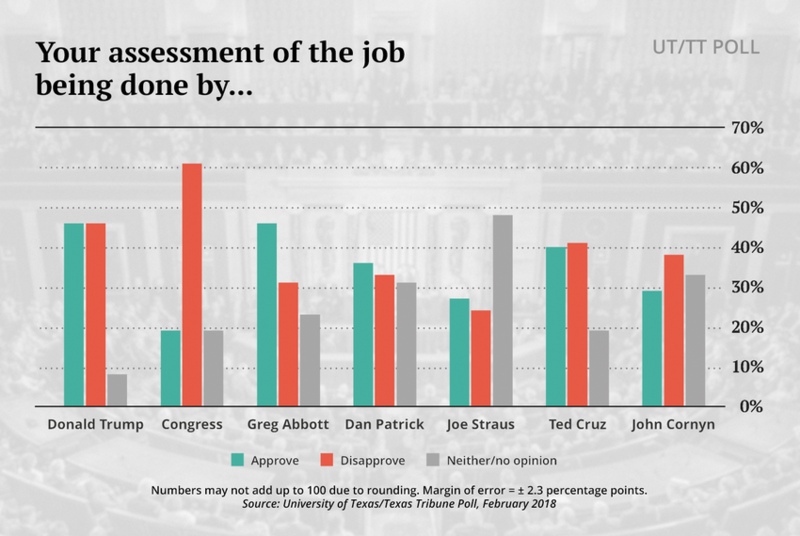 Better, in this case, is a relative thing: 19 percent of Texas voters said they approve of the job Congress is doing, while 61 percent disapprove. In October, 12 percent approved and 69 percent disapproved. Among Republicans, who have the congressional majority, 33 percent approve of Congress’ work, an improvement from 16 percent in October — before a tax bill popular with conservatives was passed. Democrats’ grading remained flat: 7 percent approve and 75 percent disapprove of federal legislators’ work; in October, 8 percent approved and 76 percent disapproved. The contrasting voter impressions of the state’s two Republican U.S. senators continue. John Cornyn had approving marks from 29 percent of all voters, 47 percent of Republicans and 10 percent of Democrats. Overall, 38 percent of voters disapprove of the job Cornyn's doing as the second-highest-ranking member of the Senate majority’s leadership. That’s driven by the disapproval of 59 percent of Texas Democrats. Contrast that with his likely general election opponent, U.S. Rep. Beto O'Rourke. The El Paso Democrat has never been on a statewide ballot, and it shows, with 58 percent of all voters saying they have neither a favorable nor an unfavorable opinion of him. Among Democrats, 52 percent have a favorable opinion of O’Rourke, 4 percent have an unfavorable opinion and 44 percent have no opinion at all. Among Republicans, 8 percent were favorable, 22 percent were unfavorable and 70 percent were neither positive nor negative. The Straus results have a less-partisan twang: Among Republicans, 33 percent approve and 22 percent disapprove of his work; among Democrats, 25 percent approve and 28 percent disapprove. The partisans go in separate directions when it comes to the governor and the lieutenant governor. While 81 percent of Republicans give Abbott good marks, only 12 percent of Democrats do so; Patrick got high marks from 67 percent of Republicans and only 8 percent of Democrats.